What is the secret of African Mango? reduces appetite and helps you feel full for longer! African Mango is a perfect solution for those who have been disappointed by numerous diets that didn’t bring expected results. It will safely help you burn superfluous fat and help you maintain and control your body weight. The product is based on the African mango fruit, which is rich in vitamins and minerals. African mango seeds contain a large amount of fiber, which provides a feeling of satiety for longer and significantly reduces appetite. African Mango also contains a powerful antioxidant (Irvingia Gabonensis) which stimulates weight loss and fat burning. Additionally, African Mango keeps leptin in balance and since leptin is responsible for managing the body's energy reserve, it can be extremely effective in helping people to achieve their dream body. For many years it has been a strong competition for slimming formulas containing the famous Acai berry. African Mango isn't only effective in weight loss, it also has many other health benefits. It has been shown to lower cholesterol, prevent inflammation and ensure proper levels of C-reactive protein and adiponectin in the body. It can also regulate blood glucose levels and help to eliminate toxins. 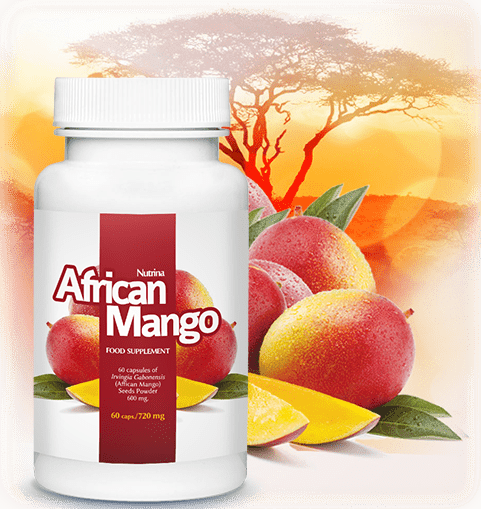 Based on natural ingredients, with no unnecessary fillers and harmful substances, African Mango has become a hit on the market of dietary supplements! African Mango is produced in the United Kingdom in accordance with the standards of GMP. Clinical studies on African mango conducted at the University of Yaounde (Cameroon) in 2005 confirmed its effectiveness. The object of the study was the impact of Irvingia Gabonensis (an antioxidant found in African mango) on weight loss. 40 people took part in the study. 28 participants of the study were taking 1.05 grams of an African mango extract, three times a day. A placebo was given to other 12 people. The duration of the study was 4 weeks. Within this timespan, the participants taking African mango reduced their body weight by as much as 5.26%! In contrast, people taking placebo reduced their body weight by only 1.26%. African Mango is a proven and extremely effective way to lose extra weight. This safe dietary supplement will not only reduce your fat tissue, but it will help you to get and keep your dream body! Do you want to get rid of extra weight and those embarrassing belly creases? Now it is possible!